Petra Lloyd is a former musician and teacher from South Wales. She’s also a passionate supporter of animal charities. A few years ago, Petra was horrified to discover that organised dog fighting was still widely active across the UK. This discovery inspired her to want to do something to help stamp out this illegal sport. She had an idea for a series of fact-based storybooks that would be aimed at younger readers and designed to raise the awareness of this cruel activity. Despite being an experienced writer, Petra was not sure how to take her idea and shape it into a story that would appeal to the hearts and minds of children. With the help of the ‘Write Storybooks For Children’ course Petra learned the latest techniques that enabled her to achieve her goal. 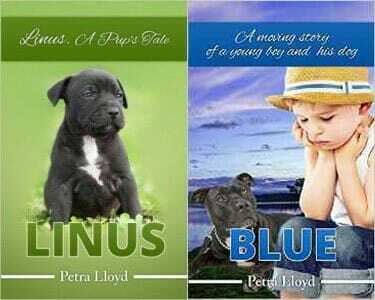 She has now self-published her first book, ‘Blue’, which she quickly followed up with a second book, ‘Linus’. Petra is currently working on the third in the series. She has since sold copies on Amazon and many more at local dog shows. She was also recently invited to be a speaker on a world service broadcast, which was hosted by a panel of the Pet Professionals Guild. Petra is inspirational proof that children’s stories can also be used to make a positive and lasting difference to the world. With the help of ‘Write Storybooks For Children’ I learnt about suitable language to use, book length, layout and how to self-publish correctly. As an OAP, I cannot begin to stop dog fighting by any way other than my writing. If I can influence some of the next generation then I will really feel that I have helped in some small way.